The first section is written by Stan Price. The year 2017 marked Stan’s 22nd – and final – year as the Executive Director of the organization. The second part comes from Kerry Meade, NEEC’s Executive Director as of October 1, 2017, as you will get a glimpse of her vision and enthusiasm for NEEC going forward. 2017 was a solid year of performance for NEEC. Now comfortably entrenched in new offices located at the Pacific Tower building just off the downtown area of Seattle, NEEC put great use to the space. Our 5,000 square feet within the building houses the Smart Buildings Center, a project of NEEC that focuses on market growth in an industry element that is destined to capture more attention and market activity in the years ahead. Central to this effort is our Training and Event Center space which NEEC makes available to anyone who shares our passion about the built environment. It’s a great space with state of the art A/V technology. When you pair that with our Large Conference Room (a telepresence space) which we also provide to the industry for free use, we have a Center which saw more than 4,000 users over the last year. Our Tool Lending Library, a repository of over 1,200 building diagnostic tools, expanded as a free lending library to Oregon as well as Washington. Our library patrons (are you one yet? – It’s easy just register on our web site) range from commercial, industrial, and multifamily customers, to commissioning firms, utilities, and researchers. We are excited about the continued growth of the library. The tools are playing a role in the City of Seattle’s new Building Tune Up requirements as well. The Building Operator Certification (BOC) continued to do what it does – offer the most recognized credential for energy efficient commercial building operations anywhere in the United States. The BOC team has expanded the footprint of the program across the U.S. and launched some companion on-line training products as well. The NEEC staff continued to provide Help Desk assistance to the City of Seattle’ energy benchmark and disclosure ordinance which one again amazed us all with eyepopping levels of compliance. Our energy analysis capabilities got put to the test with work performed on buildings in the Seattle 2030 District as well as municipalities like the City of Bellevue. Staff developed an informative and attractive dashboard which allows us to create visualizations of building performance for these data sets. If the 2015 Washington State Energy Code had you tied in knots and needing TA, then rest assured you spoke with NEEC staff who talked innumerable numbers of code officials and practitioners off the ledge as they grappled with code requirements. And, of course, we hopefully saw you from time to time at one of our free Power Hour events in Seattle and Portland. They were just after work and a perfect way to unwind with friends and colleagues – and NEEC bought the beer and wine! If you haven’t already, you should also check out NEEC’s newly revamped website – it looks great. I want to take this last opportunity to let you know what a privilege it has been these many years to introduce myself at meetings and events as a representative of the energy efficiency industry. It has been an honor. Many, if not all of you, got into this business because you had a passion about making buildings and processes work better and more efficiently. The value of doing so has many dimensions, whether it is a better economy, a better environment, or just the value of making the places we live, work, and play healthier and happier. Thank you for the opportunity and your support and friendship. It has been a whirlwind to be a part of NEEC these last few months, which, I think you might agree is characteristic of how it feels lately to work in the energy efficiency industry and the energy space, more broadly, in recent years. Over the last two months, Stan and I have travelled across states, cities, and throughout industry events and meetings to hold introductory conversations, to exchange thoughts about the work at hand to maintain the relevancy and primacy of energy efficiency in the Pacific Northwest, and to puzzle over the speed of change around us. It is timely that Stan has decided to retire from his role at NEEC right now because our industry is in the early days of what will likely prove to be a sea change, and NEEC itself is evolving alongside. 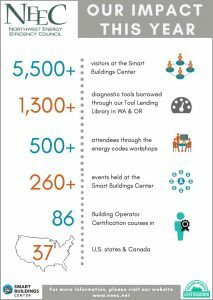 One of my first tasks in my new role at NEEC was to organize a breakfast event in which we launched the Smart Buildings Center Education Program (SBCEP). 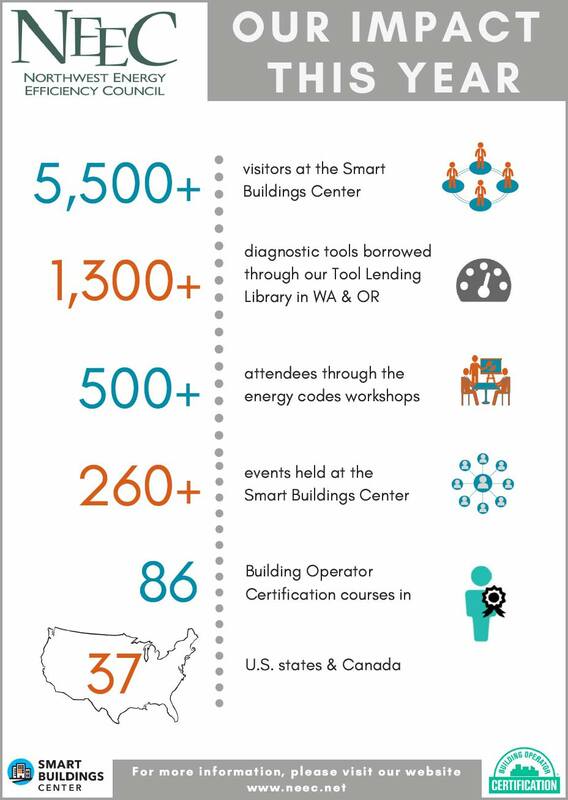 This new 501c3 organization has taken on the small task of accelerating the adoption of smart building practices and technologies through education and outreach to the cross section of stakeholders who can make that happen. The October event included a packed house and a rapt audience of individuals from the technology sector, the building sector, utilities, energy service companies, government, and community organizations who care deeply and passionately about busting through the barriers that are keeping our region from taking its leadership position in the smart building and cities space. This year, we look forward to capturing the momentum of that event to develop educational programming for the SBC that will drive this conversation forward to practical change. Along these same lines, NEEC itself will be launching a strategic planning process this year to take stock of where we’ve come from and where the future tells us we should go next. We will be reaching out to our membership to gather your thoughts on the industry changes I’ve alluded to and your views on what they mean for the future of energy efficiency, and more personally, what your industry trade association can do to help you as you navigate through the oft-seeming tumultuous waters ahead. We look forward to your engagement in this process. 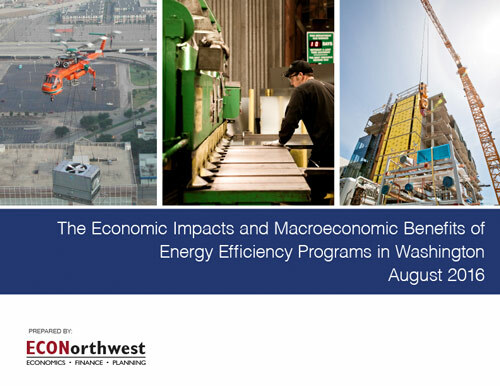 And of course, we will continue the good work that NEEC has always done hosting Power Hours, organizing the Oregon Caucus meetings, providing a robust BOC offering to the region, lending diagnostic tools through our Tool Lending Library, supporting energy benchmarking, and commercial building codes, and finding new and exciting ways that we can strengthen the energy efficiency industry. In the spirit of change, we are enclosing a graphic depicting the impact your member contribution and support enabled in 2017. We are grateful to our members for the support they have provided through the years and look forward to your continued support. P.S. If you are not a NEEC member, please join. We have the lowest dues of any energy efficiency trade association in the country.